iBoardpapers is a paperless board pack document delivery solution providing a board and management meeting experience for the digital age. 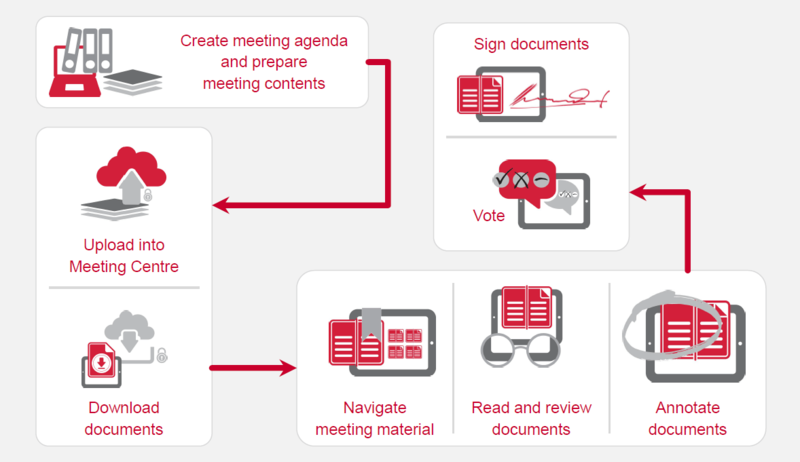 Using the uniquely simple iBoardpapers app, the solution provides meeting members with the ability to distribute documents for review and secure electronic signature, vote on agenda items, and read and annotate documents all from an iPad or tablet device. With a simple book-like interface, the iBoardpapers app makes it easy to navigate all meeting materials, thumbnail and bookmark pages for fast access and automatically and securely download and update documents. iBoardpapers cuts the time spent on delivering documents for board and management meetings in half, delivering a simple, secure, convenient and mobile digital meeting experience. Use the Microsoft SharePoint® interface to set up meetings, store documents and control document access Prepare agenda and meeting collateral ready for upload into the meeting center. Once uploaded, documents are immediately available for review, comment and secure electronic signature on iPads. Documents are automatically and securely downloaded to the iPad. Any updates made are instantly available on the iPad. Downloaded documents are encrypted and cannot be accessed from other iPad apps and can be remotely deleted from iPads if required. A book-like interface makes it easy to navigate to all meeting materials. Thumbnails and bookmarks provide fast access to specific pages.